THIS IS THE FRONT GATE TO THE IVC DESERT MUSEUM. It leads you into the parking lot. LOCATED IN IMPERIAL COUNTY, CALIFORNIA, USA, THE IMPERIAL VALLEY COLLEGE DESERT MUSEUM SPECIALIZES IN THE ARCHAEOLOGY OF THE IMPERIAL VALLEY. HERE YOU WILL LEARN ABOUT THE PREHISTORY OF THE FIRST PEOPLE OF IMPERIAL COUNTY. EVERYONE IS WELCOME. IT WILL OPEN SOON. THE IVC DESERT MUSEUM SOCIETY IS HARD AT WORK WITH EXHIBITS IN ORDER TO OPEN THE MUSEUM AS SOON AS POSSIBLE. Thanks to all our supporters -- Its time to install exhibits in the IVC Desert Museum. Since losing our original museum site to earthquake damage in 1978 the Imperial Valley College Desert Museum Society, along with its many supporters in Imperial Valley, has been hard at work. 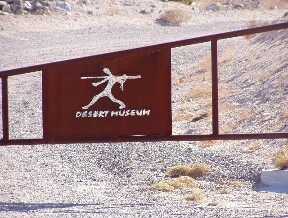 Originally the museum was known as IVC Barker Museum, after we lost our original site and moved to the new location the name was changed to IVC Desert Museum. Over the years many fundraising events have been held and grant funding received. Finally the museum building is nearly complete and exhibits are being designed and constructed. Here are some photos of the empty rooms and the first exhibit, paintings of regional earthen art by Jay von Werlhof. Later headings and labels will be added to them.